Have we seen her in another book, by any chance? Is her [Iyatil's] mask Invested? Is Iyatil from Southern Scadrial? Iyatil has heritage along those lines, but she is not. Does she use the Shardpools to get between various worlds. The Shardpools are the primary method that most people use to get between worlds. [Can you write] something interesting about the Seventeeth Shard? ...Or how about this, a character that's in the Seventeenth Shard that we don't know about? 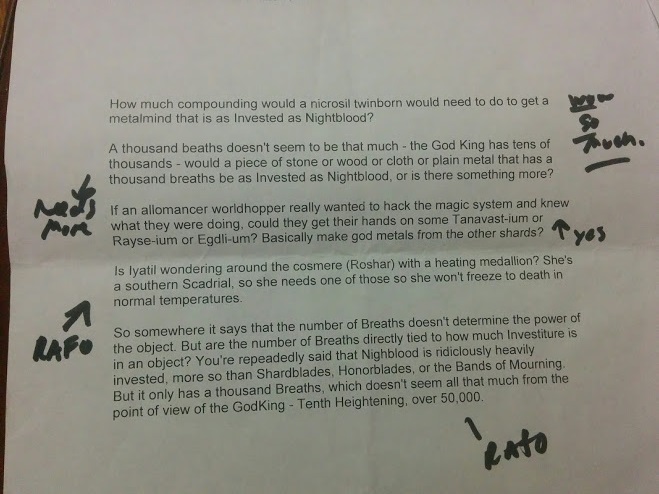 *Written:* Is Iyatil wandering around the cosmere (Roshar) with a heating medallion? She's a Southern Scadrian, so she needs one of those so she won't freeze to death in normal temperatures. RAFO on that, but it's a question you should be asking. She is related to them in the same way that I am Danish. Well, I am, my heritage is Danish. The Ghostblood that's from the southern part of Scadrial. Does that mean she can use the [Allomantic] metals? She was not born there. Iyatil is from somewhere else... She has a.. Scadrian heritage. Whether she's an Allomancer or not, I will RAFO. It is possible that someone with her lineage could. I have a question about Iyatil, can you tell me what world she is from originally. Originally? That is a question i can dodge pretty easily im afraid. Iyatil is not from a world you have seen. Have we seen Iyatil in any other context, published or unpublished? Is Iyatil of Malwish descent? In the same way that I am of Danish descent. Would she perhaps have been born on either Taldain or Threnody? She was not born on either one. Yes, he's been to a few planets, highly supervised by his babsk. So what planet is she from? Well, that's kind of a hard thing to say. She has 3 planets she's "from". For example, she's living now on Roshar, but then she's from a different planet, but that's not a planet that her people are from. So there was a mass exodus to that planet? Not exactly. If you were to find a Japanese American, where would they say that they are from? Her people did not have a mass exodus. Have we seen mass exoduses before? Yes, there are some in the cosmere. There's a mass exodus that is mentioned in one of the interludes in [Words of Radiance]. Footnote: Zas678 intially reported that the mass exodus was discussed in The Way of Kings, Arthur Dent later corrected this as Brandon actually referred to Words of Radiance.